While sitting around in a hotel room full of fifteen pinball collectors, drinking beer and watching a pin-tech fix an old EM, I was privy to a story about the late, great Python Anghelo. The story sounds more like folklore than fact, with details added and details taken away in its retelling. 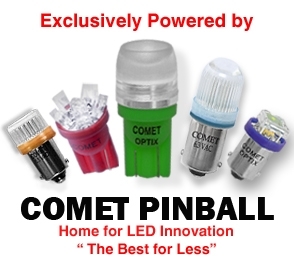 I’m not sure if this was a commonly told tale at Pinball Expo over the years, but I had never heard it before. As Jimmy Stewart says, in the film The Man Who Shot the Liberty Valance, “When the legend becomes fact, print the legend.” Fitting, since Python is a true legend in the industry. So the story goes, Python Anghelo had a favourite Polish delicatessen in Chicago that he frequented on a regular basis. Ever the lover of smoked and encased meats, this deli was his local source for some of the best Polish kielbasa and sausage in the entire city. This was not Python’s little secret, the deli was known as the go-to meat spot in the Chicagoland area. One day in late 1987, Python stopped in to load up on some of his favourite meaty treats. It was only after the butcher filled the order, that Python noticed the enormously long line to pay the cashier. He was late as it was. Waiting in that cash line would make him much, much later. So, he decided to do what any reasonable artist and pinball designer would: stuff the sausage into his coat and walk out the front door without paying for it. But the owner of the store caught him red handed. He called the cops and imposed a lifetime ban on Python, barring him from ever stepping foot inside his deli again. Python may have lost a little bit of pride that day, but more devastating was the fact that he had lost the privilege of shopping in his favourite Chicago delicatessen. Was Python ashamed? Probably not. He seemed like a guy that wasn’t ashamed of much. 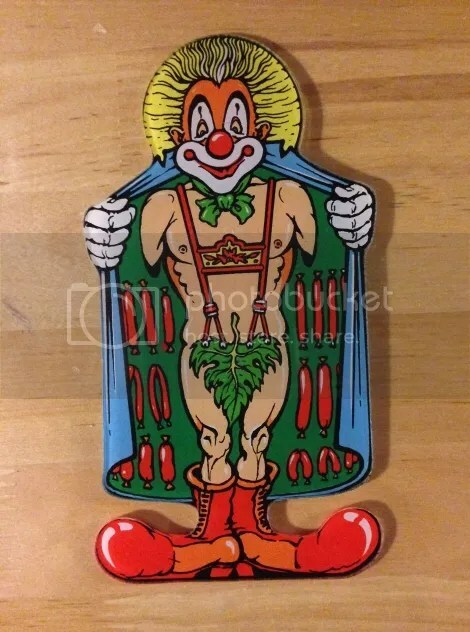 In fact, to celebrate this indiscretion, he created a promotional plastic piece for the game Cyclone that depicted a clown with a trench coat full of sausages, forever venerating the time he got caught stuffing sausages into his own coat. I’m sure you thought those hanging sausages in the clown’s coat were a reference to something phallic! Categories: People | Tags: Cyclone, Kielbasa, Polish Delicatessen, Promo Plastics, Python Anghelo, Sausage | Permalink.